This book focuses on the renal complications associated with diabetes. The first chapter provides an overview of the current scenario with respect to diabetes in the world and India in particular, factors contributing to the development of diabetes as well as measures to prevent it. 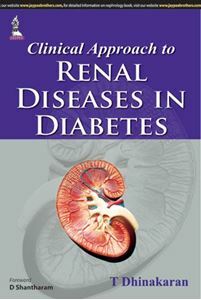 The subsequent chapters deal with diabetic kidney disease (DKD), risk factors and pathophysiology of DKD. The use of microalbuminuria as a biomarker to monitor the development and progression of DKD as well as the possibility of prevention in early stages are described. Chapters 7 to 9 describe therapeutic measures including hyperglycemia control, hypertension and proteinuria therapy as well as diet control (protein and salt restriction), cessation of smoking, weight reduction and dyslipidemia therapy. Newer therapeutic approaches are also described. The last three chapters describe other clinical manifestations of diabetic kidney disease, cardiovascular morbidity and end stage renal disease (ESRD) and their management. Chapter 04: Is Diabetic Nephropathy Preventable? Chapter 06: Microalbuminuria in Diabetic Nephropathy—A Marker or a Risk Factor?